The purpose of the Taos Watercolor Society is to encourage and promote the production of professional quality watercolor. Watercolor is defined as any water media on paper; including but not limited to watercolor, acrylic, ink, distemper, casein, and mixed media. Thank you, Tamra Testerman of the Taos News, for the great article on our watercolor show “Winter Watercolor Wonders”, which runs from December 20, 2017 to February 4, 2018 at the TCA’s Encore Gallery! Tamra’s full article is online. Opening Reception – December 21 from 4-6pm. No medium can match the delicate luminosity of transparent watercolor. As most artists know watercolor can be a hard medium to master as it can be unforgiving and unpredictable. Yet no other medium can match the delicate luminosity of transparent watercolor. Works from the Taos Watercolor Society artists capture that luminosity in portraying winter scenes that will warm your heart. Watercolor pigment is ground in gum, usually gum arabic and as is known for its transparency. However it can be made opaque by mixing with a whiting and in this form is known as body colour, or gouache; it can also be mixed with casein, a phosphoprotein of milk. One basic difference with painting in oil or acrylic and watercolor is that whites are created with opaque white while in painting in watercolor white is often created by leaving out color and letting its background white paper create its white. Your will see this technique in many of the Winter Watercolor Wonders works of art. The Watercolor Society was founded in 1992 and has promoted its members works through various exhibitions and is committed to the public’s further understanding of transparent water media as an exciting and collectable art form. TWS signature member, Jinx Wright has had her work “Vibrant Gorge” juried into the Kansas City Watercolor Society National Exhibition. The show hangs at the Mary R. Koch Art Center in Wichita from Nov 17th to Dec 18th, 2017. Best of the Southwest 2017! Join the Taos Watercolor Society Sundays at the Blumenschein Home and Museum Courtyard. Various members such as Jinx Wright, Pat Woodall, Karen McCurtain-Blair, Diane Binder and Carol Doughty will be on hand working in watercolors. Taos Watercolor Society on YOUTUBE! We are now on YOUTUBE! Watch Members Bill Baron, Diane Binder, Bob Cooley, Carol Doughty, Karen McCurtain-Blair and Jinx Wright 8/21/2016 at the Stables Gallery in Downtown, Taos, New Mexico. Click on link above to see photo album of show paintings. 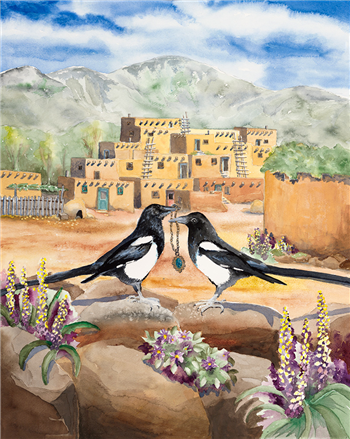 Six artists present a Taos Holiday Pop Up Gallery! See work by Bradley Sleep, Allegra Sleep, Christy Schwathe, Dawning Pollen Shorty, Karen McCurtain-Blair, and Ken Pieper! Jewelry, pottery, paintings, prints, cards & more.